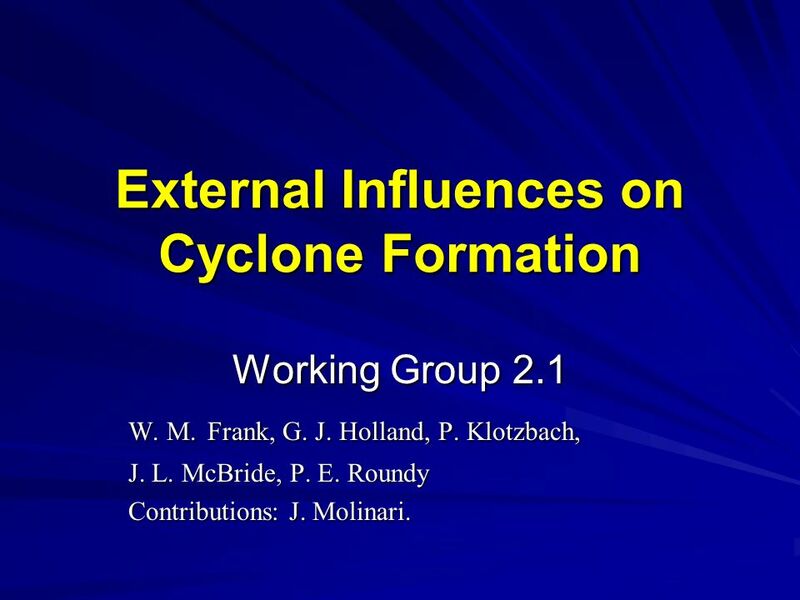 1 External Influences on Cyclone Formation Working Group 2.1 W. M. Frank, G. J. Holland, P. Klotzbach, J. L. McBride, P. E. Roundy Contributions: J. Molinari. 7 Waves and Genesis: 1. 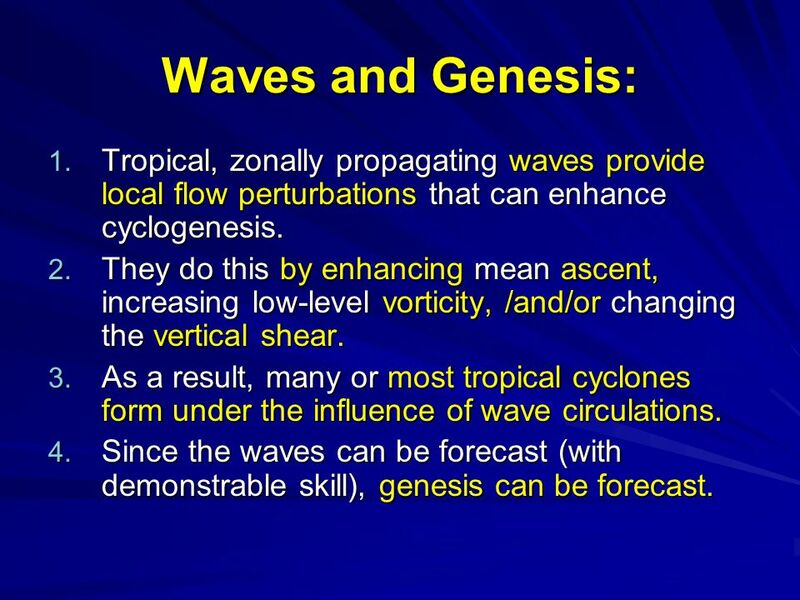 Tropical, zonally propagating waves provide local flow perturbations that can enhance cyclogenesis. 2. They do this by enhancing mean ascent, increasing low-level vorticity, /and/or changing the vertical shear. 3. 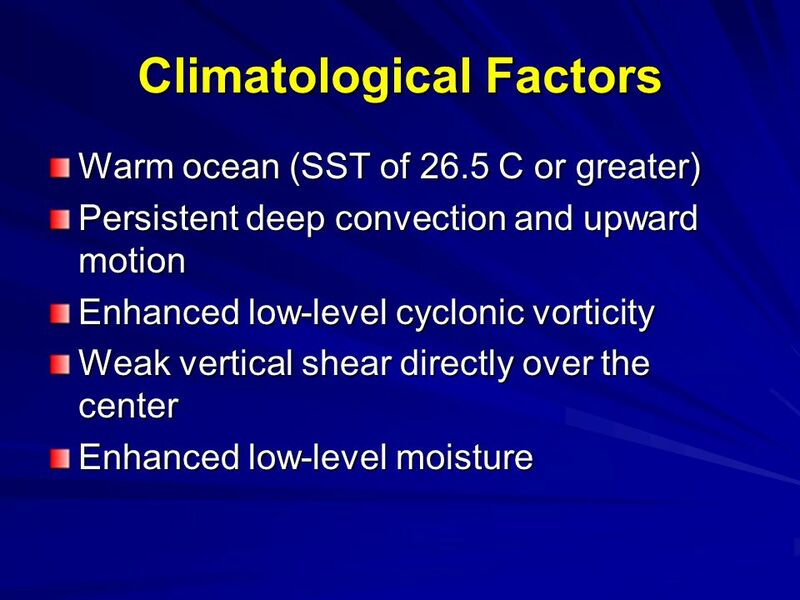 As a result, many or most tropical cyclones form under the influence of wave circulations. 4. 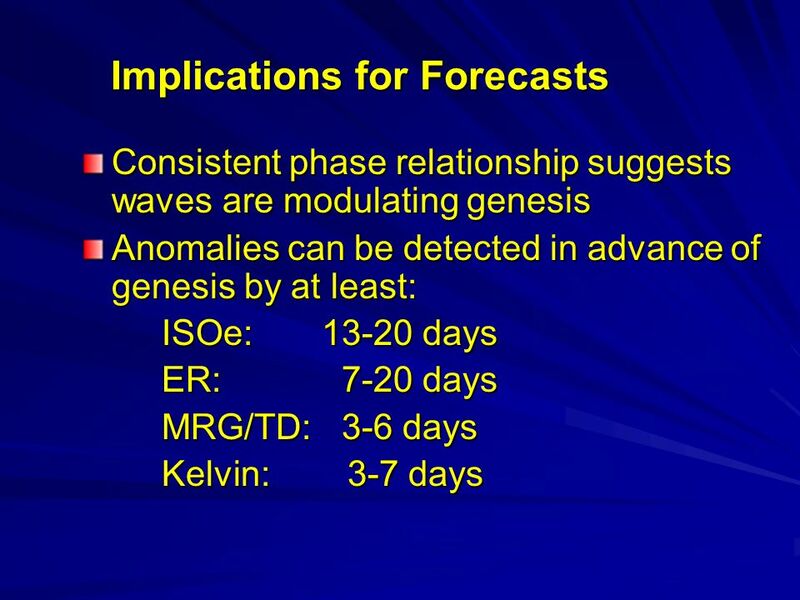 Since the waves can be forecast (with demonstrable skill), genesis can be forecast. 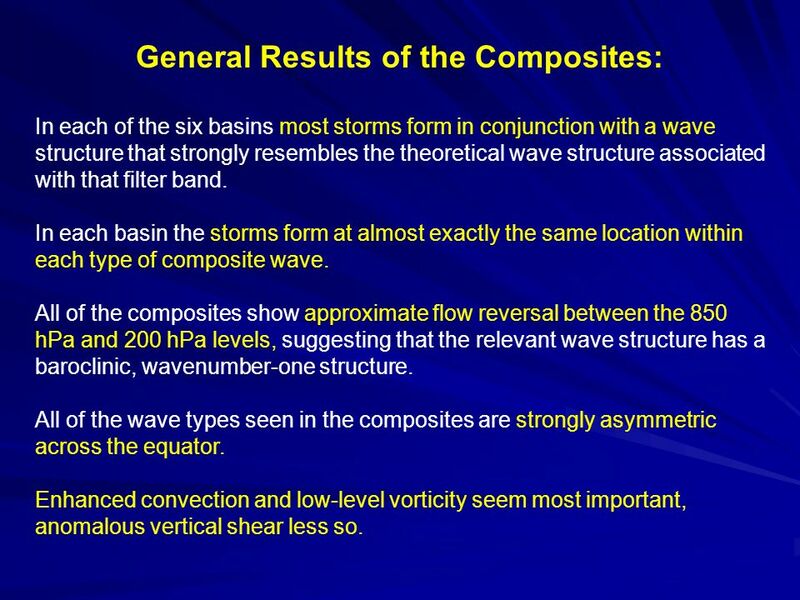 24 General Results of the Composites: In each of the six basins most storms form in conjunction with a wave structure that strongly resembles the theoretical wave structure associated with that filter band. In each basin the storms form at almost exactly the same location within each type of composite wave. 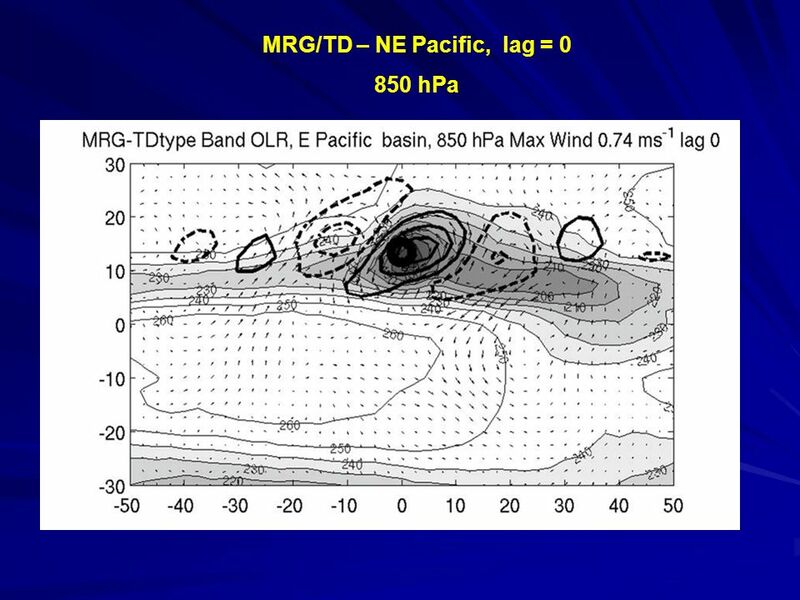 All of the composites show approximate flow reversal between the 850 hPa and 200 hPa levels, suggesting that the relevant wave structure has a baroclinic, wavenumber-one structure. 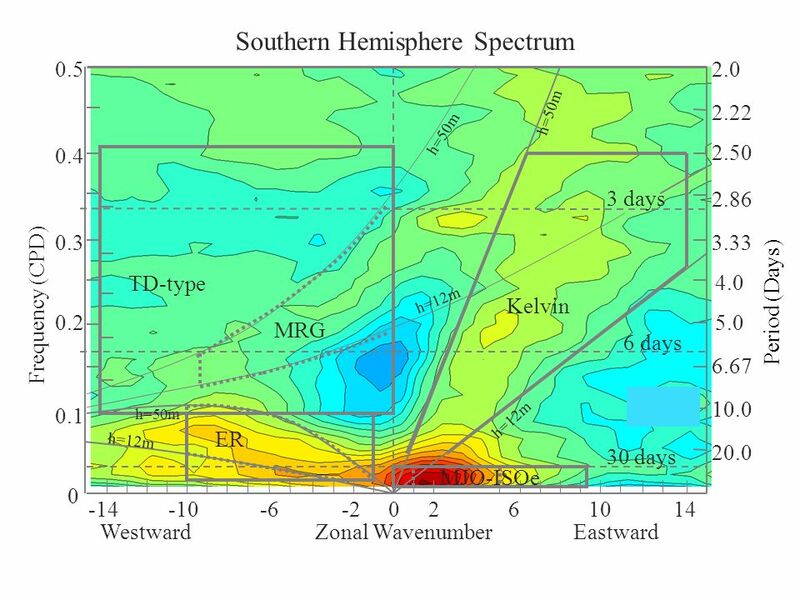 All of the wave types seen in the composites are strongly asymmetric across the equator. Enhanced convection and low-level vorticity seem most important, anomalous vertical shear less so. 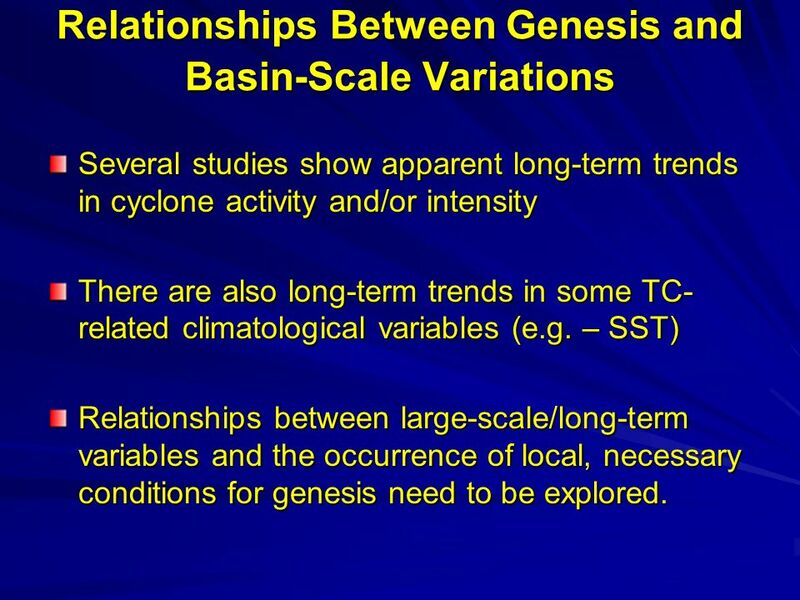 28 Relationships Between Genesis and Basin-Scale Variations Several studies show apparent long-term trends in cyclone activity and/or intensity There are also long-term trends in some TC- related climatological variables (e.g. 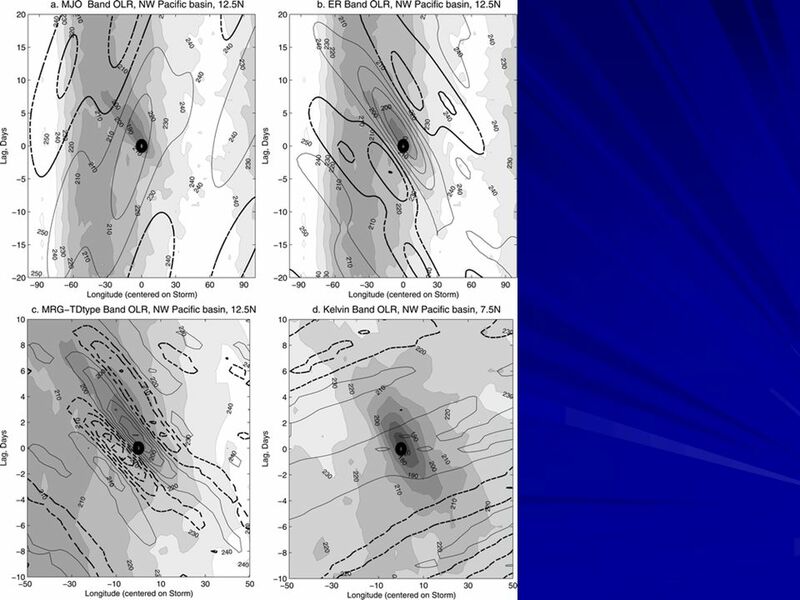 – SST) Relationships between large-scale/long-term variables and the occurrence of local, necessary conditions for genesis need to be explored. 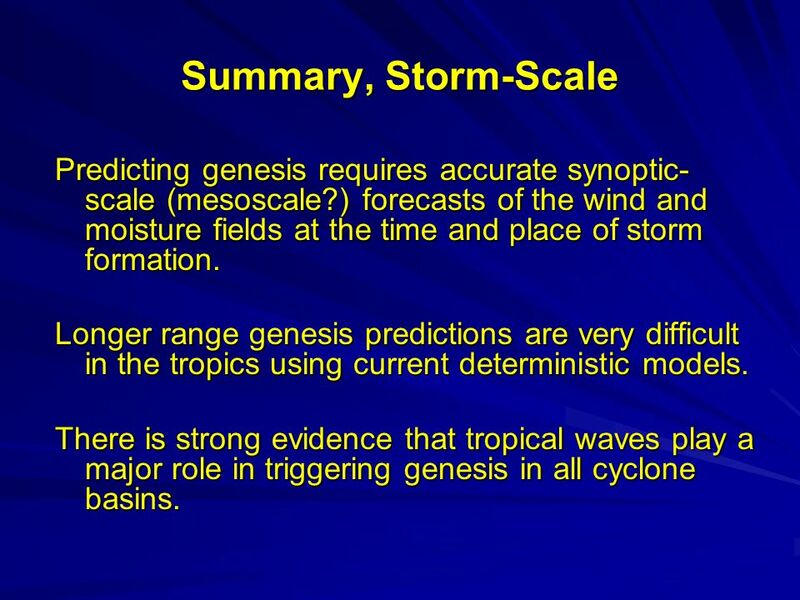 30 Summary, Storm-Scale Predicting genesis requires accurate synoptic- scale (mesoscale?) 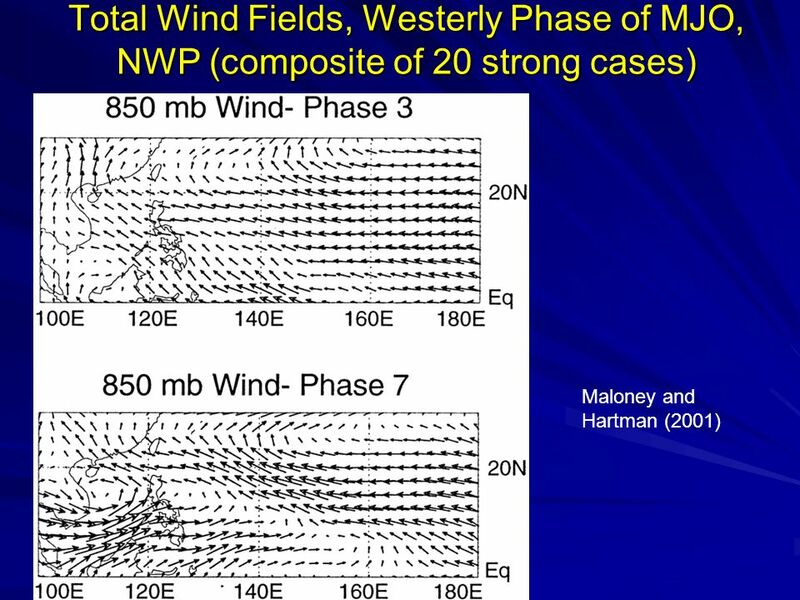 forecasts of the wind and moisture fields at the time and place of storm formation. 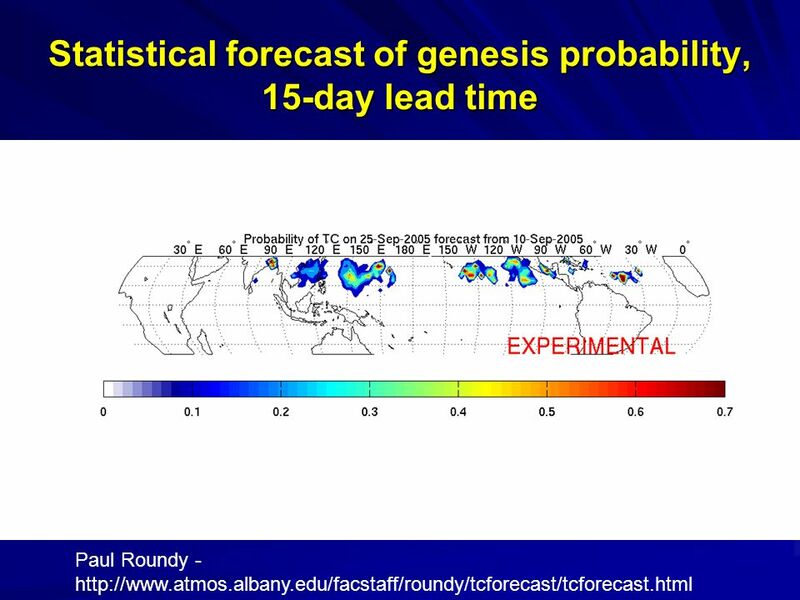 Longer range genesis predictions are very difficult in the tropics using current deterministic models. 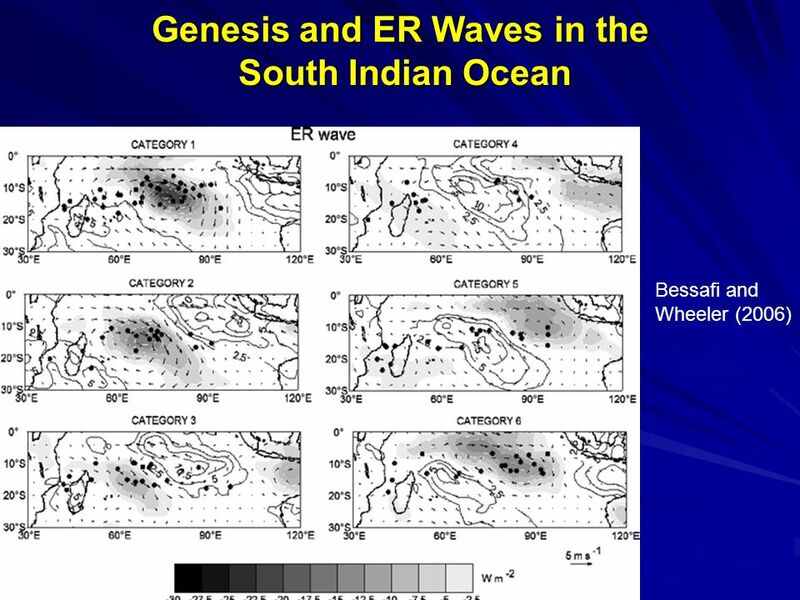 There is strong evidence that tropical waves play a major role in triggering genesis in all cyclone basins. 31 Summary, cont. 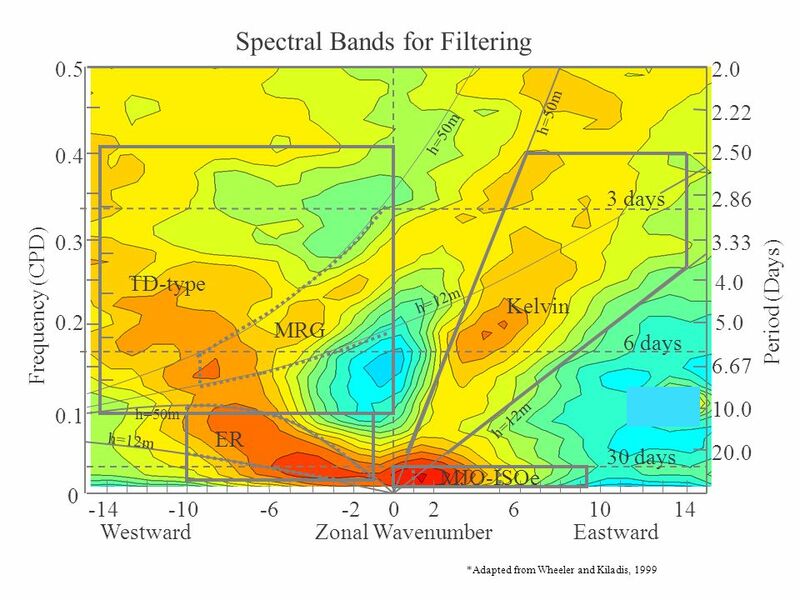 Tropical waves are predictable using statistical techniques. Other statistical genesis prediction techniques are also showing promise. 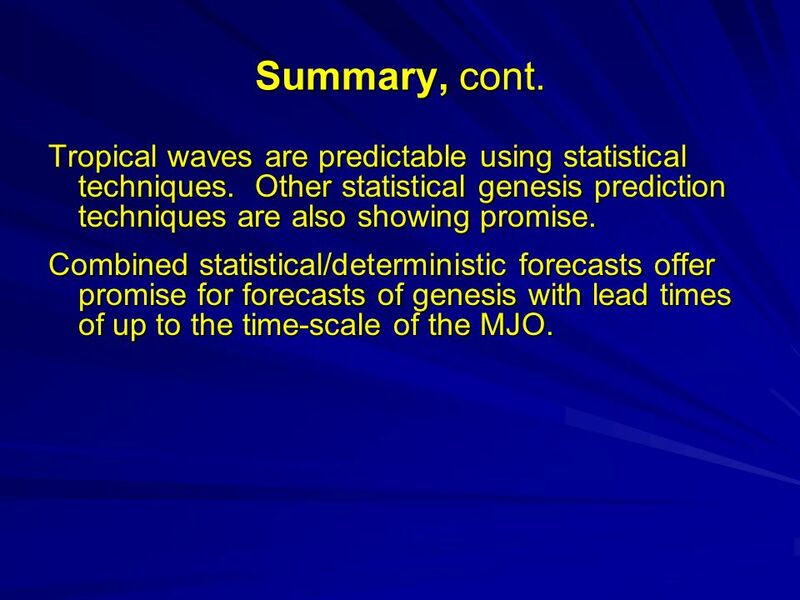 Combined statistical/deterministic forecasts offer promise for forecasts of genesis with lead times of up to the time-scale of the MJO. 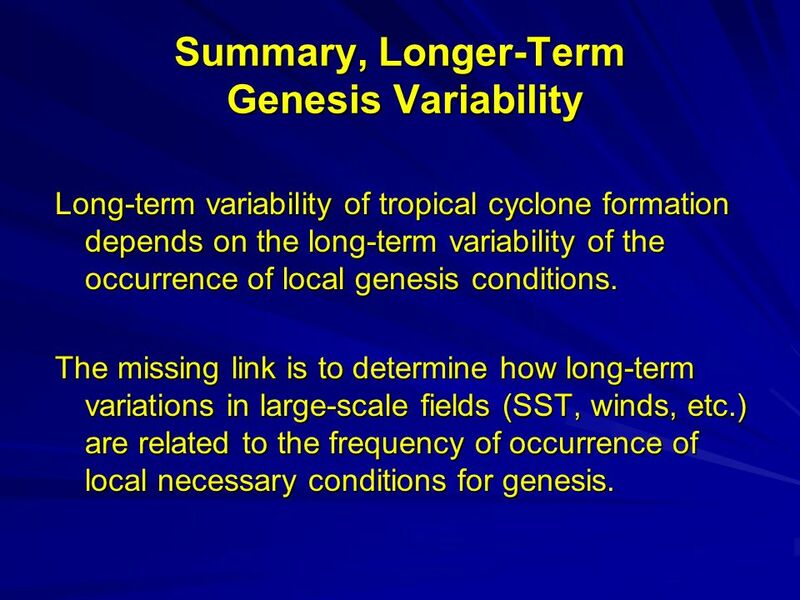 32 Summary, Longer-Term Genesis Variability Long-term variability of tropical cyclone formation depends on the long-term variability of the occurrence of local genesis conditions. 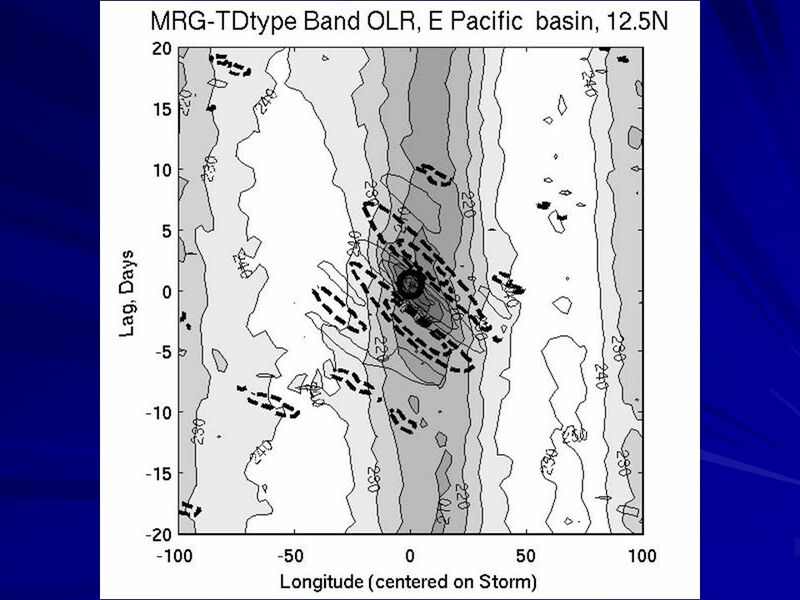 The missing link is to determine how long-term variations in large-scale fields (SST, winds, etc.) are related to the frequency of occurrence of local necessary conditions for genesis. 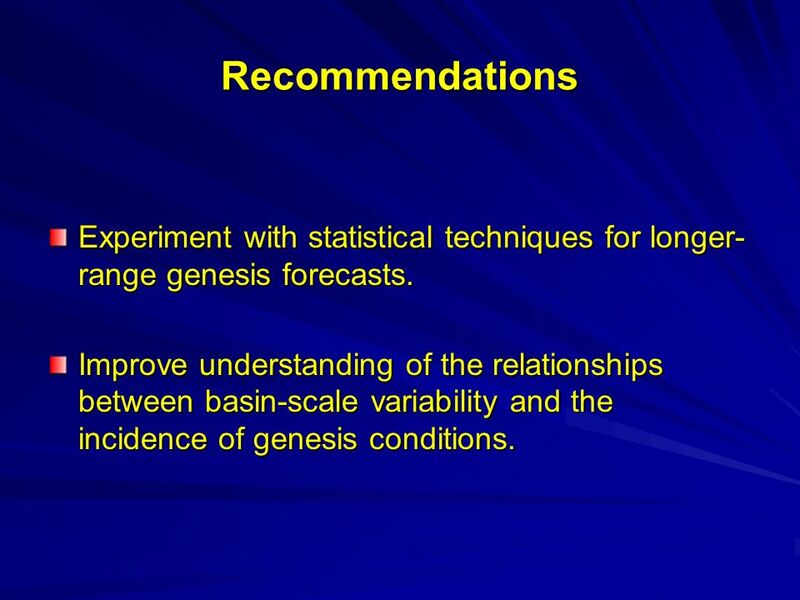 33 Recommendations Experiment with statistical techniques for longer- range genesis forecasts. Improve understanding of the relationships between basin-scale variability and the incidence of genesis conditions. 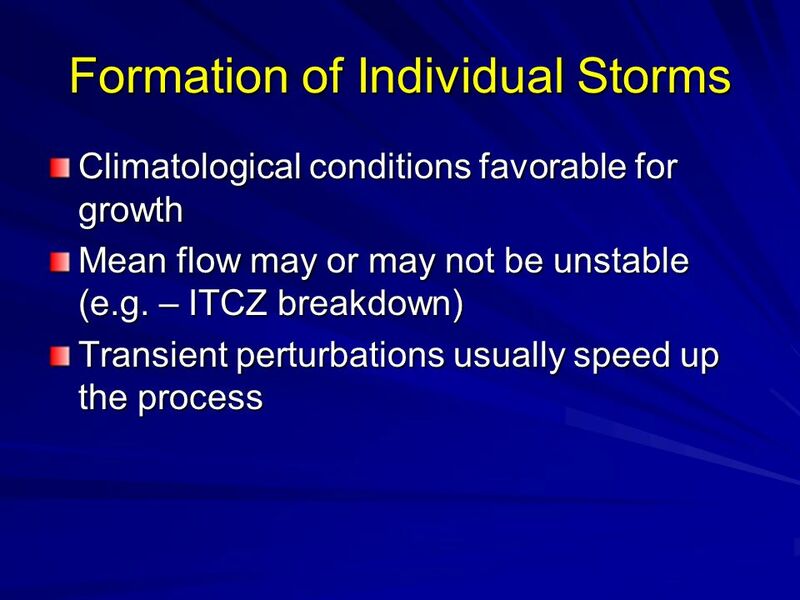 Download ppt "External Influences on Cyclone Formation Working Group 2.1 W. M. Frank, G. J. Holland, P. Klotzbach, J. L. McBride, P. E. Roundy Contributions: J. Molinari." 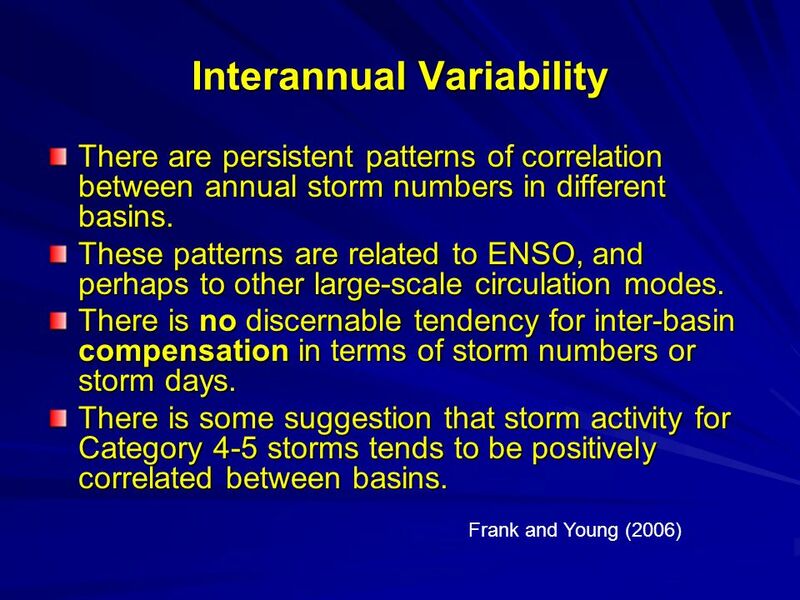 6 th International Workshop on Tropical Cyclones Topic 4.1: Variability of Tropical Cyclone Activity/Intensity on Intraseasonal and Interannual Scales. 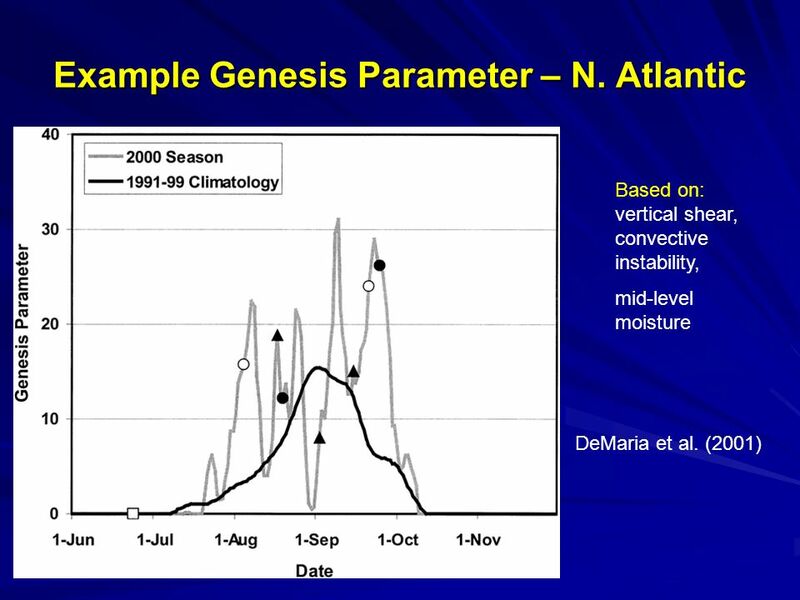 Interactions between the Madden- Julian Oscillation and the North Atlantic Oscillation Hai Lin, Gilbert Brunet Meteorological Research Division, Environment. The effect of doubled CO 2 and model basic state biases on the monsoon- ENSO system: the mean response and interannual variability Andrew Turner, Pete. 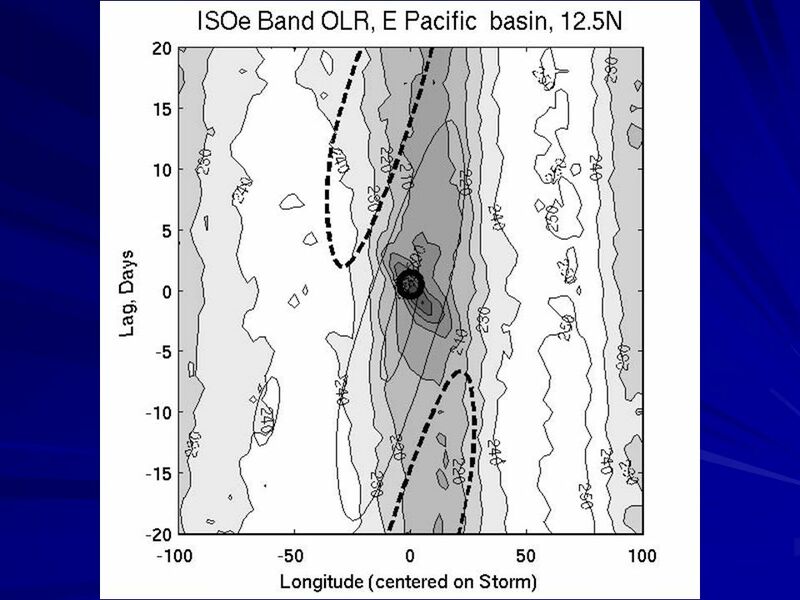 The MJO, Equatorial Waves, and TCs over the South Indian Ocean: Their Associations and use for Prediction Matthew Wheeler Centre for Australia Weather. 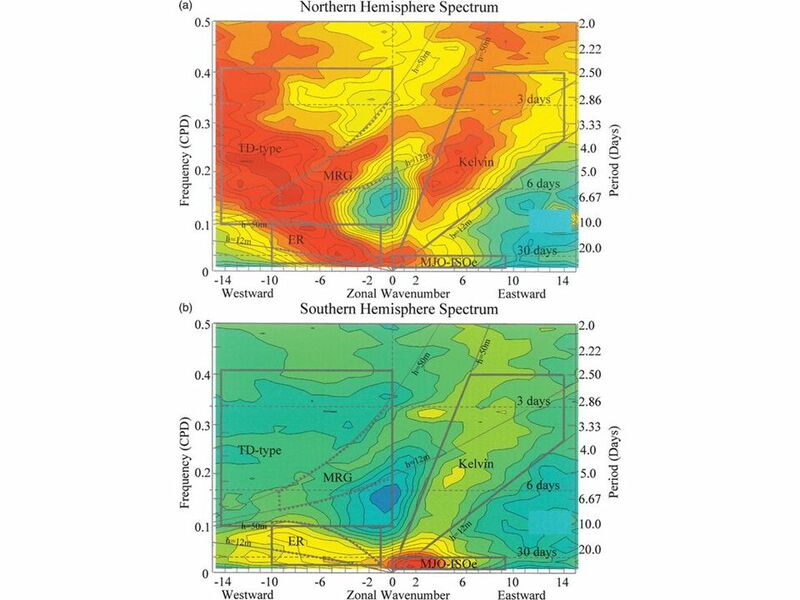 Variability of the Atlantic ITCZ Associated with Amazon Rainfall and Convectively Coupled Kelvin Waves Hui Wang and Rong Fu School of Earth and Atmospheric. 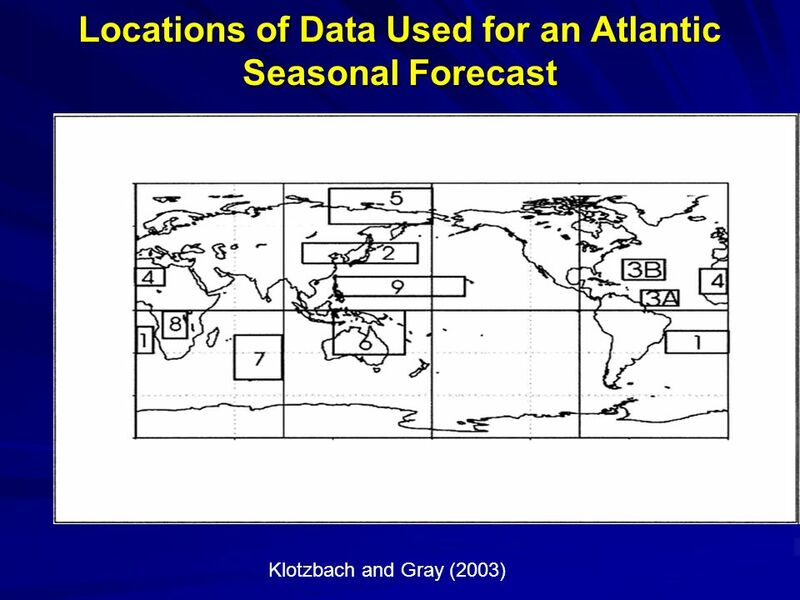 Tropical Cyclone Forecasts Dr. Richard J. Murnane Risk Prediction Initiative Bermuda Biological Station for Research, Inc.
Madden/Julian Oscillation: Recent Evolution, Current Status and Forecasts Update prepared by Climate Prediction Center / NCEP February 20, 2006. 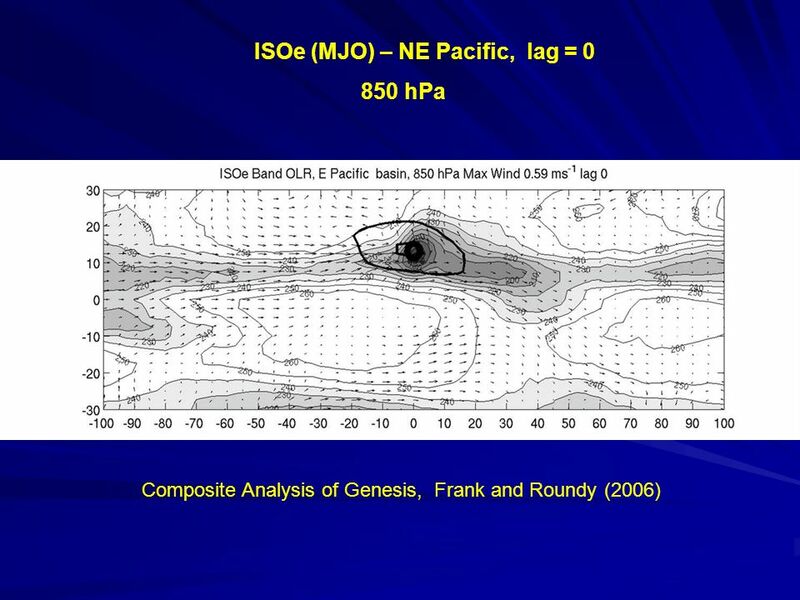 Impact of the Madden- Julian Oscillation on ENSO Michael Delman Advisor: Dr. Doug Sinton 12/8/05. 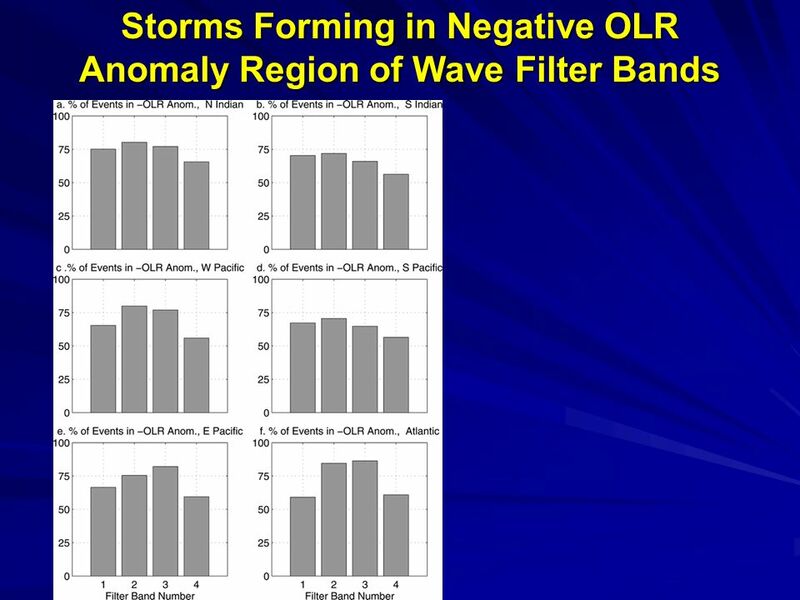 Equatorial Waves and Tropical Cyclogenesis Carl J. Schreck, III University at Albany. 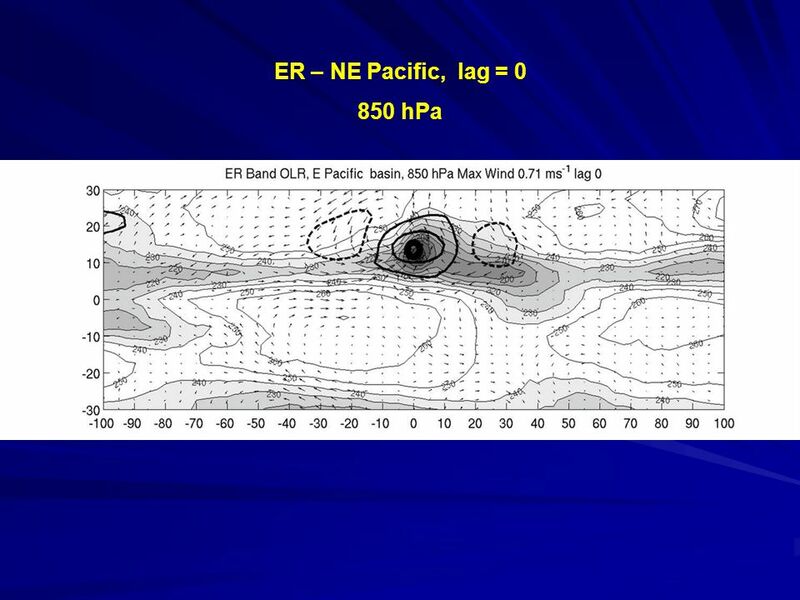 Tropical Cyclone Formation and Extratropical Transition IWTC – V Recommendations There is a strong need for a consistent definition of tropical cyclone. 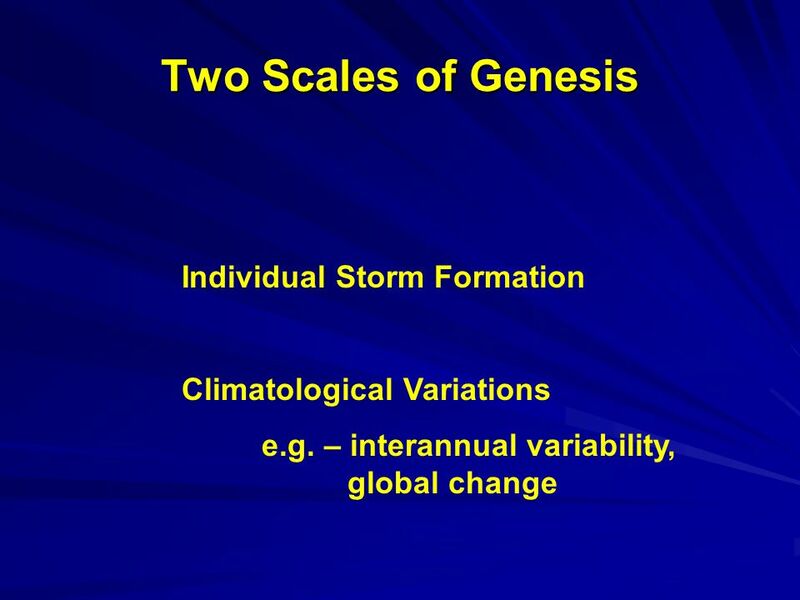 General contents Provide some predictability to the tropical atmosphere beyond the diurnal cycle. 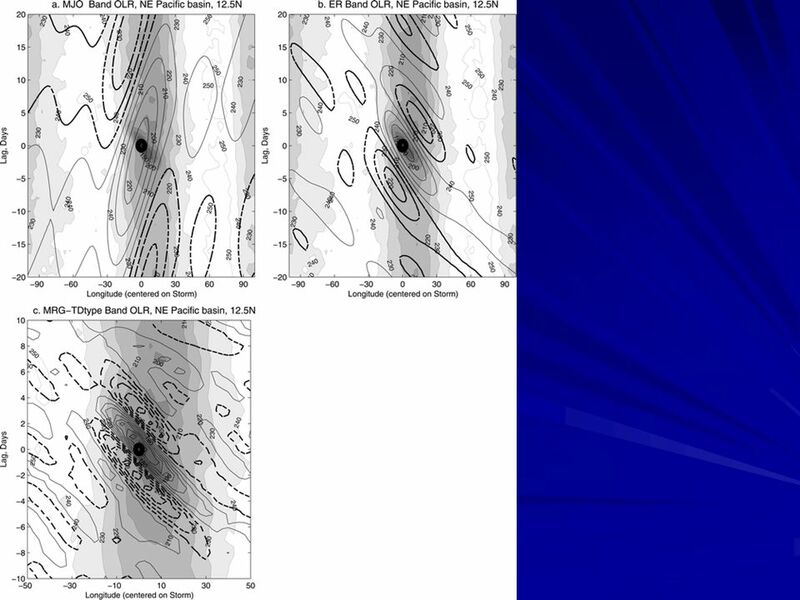 Equatorial waves modulate deep convection inside the. 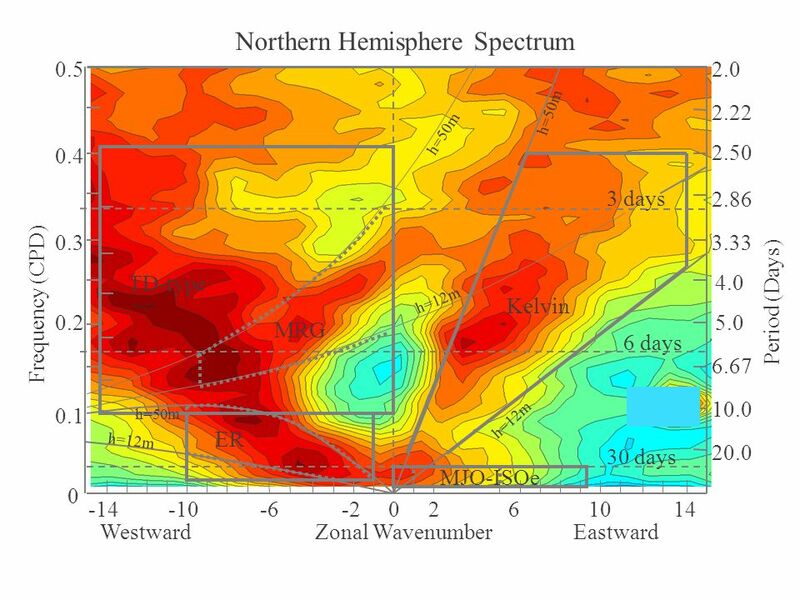 WEST AFRICAN STORM TRACKS AND THEIR RELATIONSHIP WITH ATLANTIC TROPICAL CYCLONES Susanna Hopsch Department of Earth and Atmospheric Sciences University. Western Pacific Tropical Cyclogenesis Precursors Ph.D. Prospectus Carl J. Schreck, III. A Case Study of an Outbreak of Twin Tropical Cyclones Carl J. Schreck, III Department of Earth and Atmospheric Sciences University at Albany, SUNY. 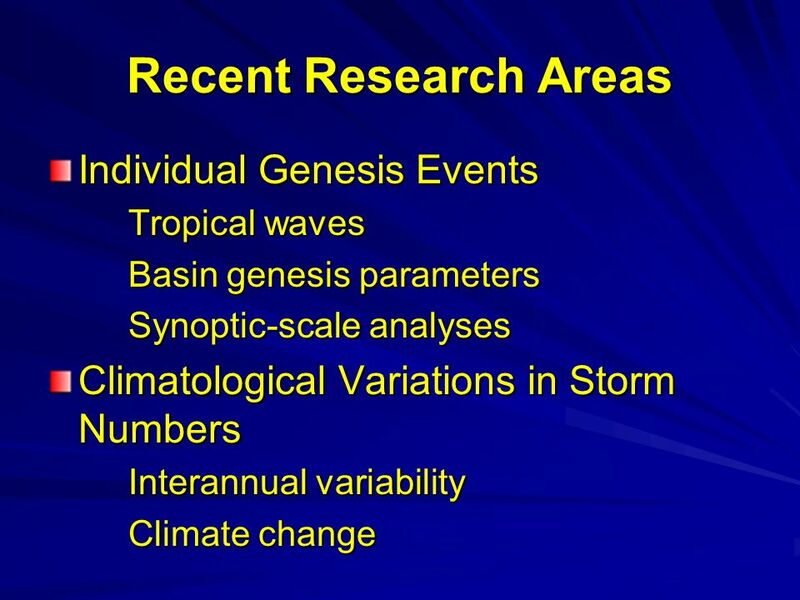 Equatorial Rossby Waves and Twin Tropical Cyclogenesis Carl J. Schreck, III John Molinari Department of Earth and Atmospheric Sciences University at Albany. 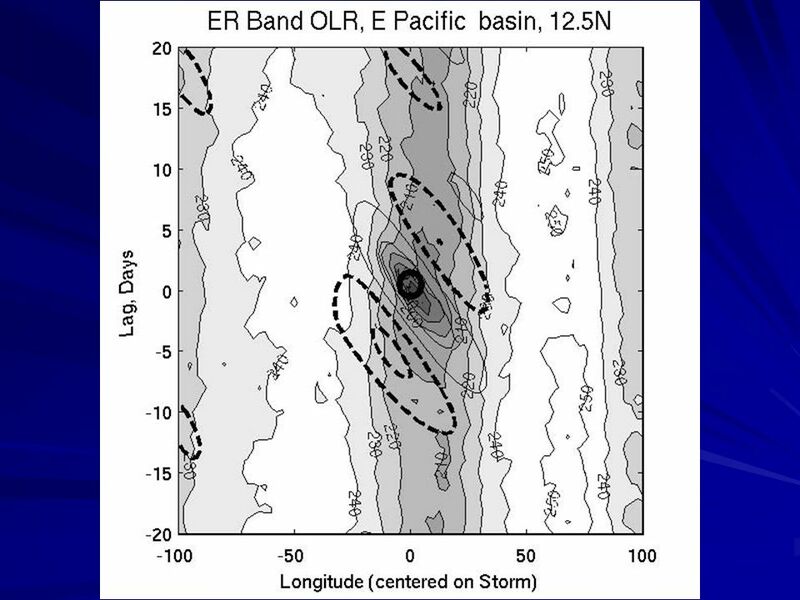 TROPICAL CYCLOGENESIS IN ASSOCIATION WITH EQUATORIAL ROSSBY WAVES John Molinari, Kelly Canavan, and David Vollaro Department of Earth and Atmospheric Sciences. 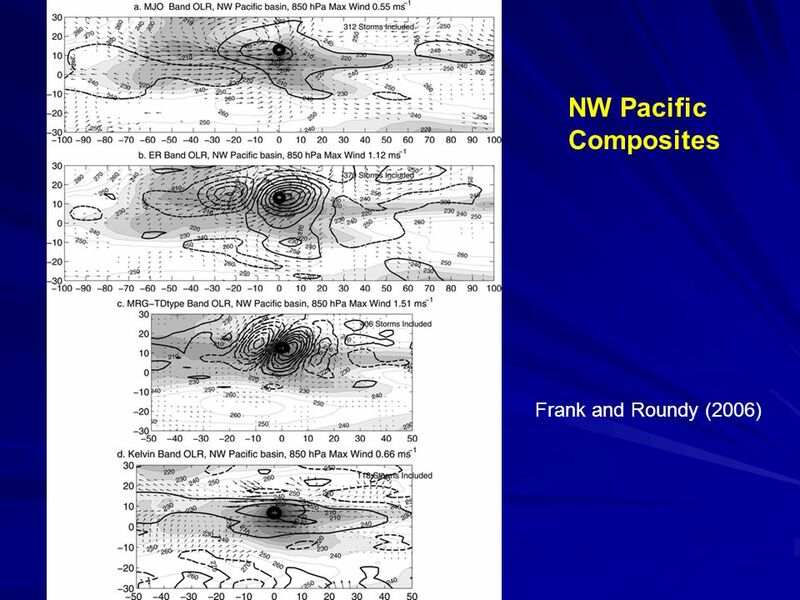 Interactions Between Equatorial Waves and Tropical Cyclones Paul E. Roundy WWOSC August 2014. Madden/Julian Oscillation: Recent Evolution, Current Status and Forecasts Update prepared by Climate Prediction Center / NCEP May 17, 2005.